Domaine Bois de Boursan was founded in 1955, thanks to Jean Versino, who moved the family from the winemaking region of Piedmont in Italy over to Chateauneuf du Pape. Bois de Boursan takes its name from the small area where they are located, which is not far from the Chateauneuf du Pape village. Like many producers in the Southern Rhone valley, they started off selling their wine in bulk to negociants. At Bois de Boursan, that continued until the some point in the late 1980’s. That changed when the younger, Jean-Paul Versino began managing Bois de Boursan. One of the interesting aspects of the vineyards belonging to Bois de Boursan is they have 15 different soil types in their 16 hectoliters of vineyards. The vineyards are divided into 27 different parcels. On average, the vines are a respectable sixty years of age. All vineyard management is 100% organic here. However, at Bois de Boursan, they also own old vine Grenache that is more than 100 years of age. The estate uses 15.5 hectares for the production of red Chateauneuf du Pape while 1 hectare of vines is reserved for their white Chateauneuf du Pape wine. The best vintages of Domaine Bois de Boursan are: 2018, 2017, 2016, 2015, 2012, 2010, 2009, 2007, 2005, 2001, 2000 and 1998. Domaine Bois de Boursan produces 2 red Chateauneuf du Pape wines and 1 Chateauneuf du Pape blanc. However, from time to time, the domaine has also produced a special cuvee of Bois de Boursan les Baud. Bois de Boursan Tradition is produced from a blend of 65% Grenache, 15% Mourvedre, 15% Syrah and 5% other varieties. The vines for this wine range from 40-80 years of age. The terroir is rocks, clay, sand and limestone. 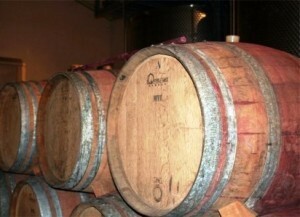 Bois de Boursan is aged in large foudres that were previously used to make beer in the Alsace region. Close to 3,200 cases are produced each year. Domaine Bois de Boursan Cuvee des Felix made its debut in 1995. In the beginning, the production was quite small, today close to 5,000 bottles are produced. The wine is made from a blend that on average 60% Old vine Grenache, 25% Mourvedre, 10% Syrah and 5% of various allowable grapes types. The Grenache is from old vines that for the most part are 90 years old, give or take a few years. The terroir is various galets and sand. Bois de Boursan is always the product of old vines with very low yields. The yields can be close to 20 hectoliters per hectare. Bois de Boursan Cuvee des Felix in a combination of demi-muids and old, used, French, oak barrels for close to 18 months. The production is quite small as only 400 cases are produced each year. Domaine Bois de Boursan les Baud is produced from their oldest vines that can be over 100 years of age. The wine is usually a blend of 50% Grenache, 35% Mourvedre and 15% Syrah. The grapes are fully destemmed. The wine is aged in a combination of 20% new, French oak barrels and stainless steel tanks. The production hovers around 125 cases. The wine so far has been produced in 2003 and 2007. Domaine Bois de Boursan Blanc is quite hard to find as the production is close to 150 cases per year. Made from a blend of 35% Grenache Blanc, 35% Clairette, 15% Roussanne and 15% Bourboulenc, the wine is vinified in tanks and then aged in a combination of new and old French oak casks for 6 months before bottling. Bois de Boursan can be enjoyed on the young side. Young vintages are better with 1-2 hours of decanting. This allows the wine to soften and open its perfume. Older vintages might need very little decanting, just enough to remove the sediment. Bois de Boursan is usually better with 3-5 years of bottle age. Of course that can vary slightly, depending on the vintage. In the best vintages the wine should be consumed within 7-18 years after the vintage. Bois de Boursan is best served at 15.5 degrees Celsius, 60 degrees Fahrenheit. The cool, almost cellar temperature gives the wine more freshness and lift. Domaine Bois de Boursan Rouge is best served with all types of classic meat dishes, veal, pork, beef, lamb, duck, game, roast chicken, roasted, braised, grilled dishes, smoked meats, barbecue, sausage, cassoulet and cheese. Bois de Boursan is also good with Asian dishes, hearty fish courses like tuna, mushrooms and pasta. The white wine of Bois de Boursan is best served with a myriad of different seafood dishes, shellfish, crab, lobster, sushi, sashimi, chicken, pork and veal, as well as Asian cuisine and cheese. The licorice and black cherry smell as good as they taste. Long, with garrigue and spice box notes kicking in at just the right time, this should age nicely. The wine was made using 60% Grenache, 25% Mourvedre, 5% Syrah, 5% Cinsaut and 5% Counoise. Incense and dark cherries pop from the start. Fresh and juicy, with a blast of garrigue and olive, to complicate the dark cherries in the finish. The wine was made using 75% Grenache, 10% Syrah, 10% Mourvedre, 3% Cinsault and 2% Counoise. Early drinking, open, medium bodied, soft textured wine. The character here is about the peppery, kirsch and strawberry center with nuances of underbrush, herbs and olives. 5 spice, incense and black cherries led off the wine. There is good freshness and intensity in the mid palate and finish. Give it a few years to develop more complexity. From a blend of 70% Grenache, 10% Syrah, 10% Mourvedre and 10% Counoise, the wine reached 14.5 alcohol. Floral, black cherry and licorice notes, silky textures and a blast of ripe, sweet, fresh, polished red fruits shine through the round textured finish. From a blend of 65% Grenache, 25% Mourvedre, 5% Cinsault and 5% Syrah. Menthol and crisp, peppery red berries pair with soft, silky textures and a polished, cherry finish. From a blend of 65% Grenache, 25% Mourvedre, 5% Syrah and the remainder coming from assorted varietals, the wine reached 14.5% alcohol. Earthy notes complicated by strawberry and raspberries produced an elegant, clean and fresh wine for early consumption. I'm still on my young Chateauneuf kick and most of the wines from 2010 have been stellar. This was no exception with its ripe, lusty, peppery black raspberries, herb and earthy personality. Rich and intense, the luscious, ripe finish is filled with spicy, jammy, dark red fruits. As good it is now, it's only going to get better with a few years of age. Ripe, round, lush and with perfectly ripe black cherries, plums, black raspberries, wet earth and 5 spice aromatics, this is drinking well today. If you like young Grenache blends, pull a cork and enjoy it, for its ripe, forward fruit. Blending 65% old vine Grenache with 25% Mourvedre, Syrah and other assorted Rhone varieties produced a lush, jammy Chateauneuf du Pape filled with sweet, ripe, black cherry, kirsch, pepper , earth and black raspberry. This modern styled Chateauneuf du Pape is already fun to drink most Southern Rhones from 2007. Fully mature and rocking it, with its earthy, barnyard, kirsch and garrigue aromatics. Rich, ripe, vibrant and lush, the is more than enough ripe, black and red fruits in the finish to keep it all interesting. If the horse or barnyard aromas were a little less potent, the wine would have received a higher score. Beauty for this wine is going to be in the eyes of the beholder. Drinking at perfection, this beauty was driving on all 12 cylinders with its rich, depth of flavor. Ripe, sweet, spicy fresh berries, full bodied, concentrated and long, there is a lot to like about this wine. Still young, it should drink at this level for at least another decade. Garrigue, kirsch, wet earth, the perfect touch of barnyard and a hint of over ripe strawberry is the perfect way to let you know you are in Chateauneuf du Pape. Rich, silky and bordering on lush, the wine ends with wild cherry liqueur complicated by a touch of green olive tapenade. Popped, poured and rockin'! This is drinking at absolute perfection. There is no reason to wait to pop a cork. I'm happy to have more in the cellar. Provencal herbs, black pepper, licorice, spice, black raspberry and black cherry aromas lead to a fully mature, concentrated, Chateauneuf du Pape. This wine was a little more exciting in previous tastings. I'm going to drink my last remaining bottle sooner than later. Garrigue, jammy black and red fruits with fresh ground pepper and a hint of earth tickle your nose. Lush, ripe fruit spills over your palate in layers of flavor with ripe, red fruit filled finish.